Hooray! 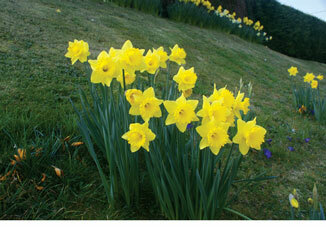 we have locally grown Malvern City daffodil bulbs for this year’s planting season. Malvern City is a classic all yellow trumpet daffodil. It is tall-growing (50cm) and an early flowering variety, a perfect cut flower. These bulbs are extremely versatile. They look awesome either planted in the garden, in pots or naturalised; planted in drifts under trees in a woodland setting. Be quick limited numbers. Grant is growing 50,000+ ecosourced natives for our Sweeny Environments clients for this winter planting season. He is growing some extras; so please call in or phone us if you are planning on doing any planting around wetlands, ponds, streams, puddles, coastal areas or bush remnants. Come and learn how to unleash the ‘Practical Outcomes that Grow Value’ on your property!